Please fill out the following form to start the process in completing your estate plan. Fill out as much as you can, as all the information is required to complete your estate plan. All information will be reviewed and you will be contacted by a lawyer. If you have more than six children the remaining children will be added during the interview process. If yes, is the divorce final? Are there children by your former marriage? Is the value of your estate in excess of $2,000,000? gifts to charities, church, alma mater, etc.? Note: You will be contacted and all of the information reviewed before preparation of your plan. At that time, you may ask any questions that you (and/or your spouse) may have. If there are to be any additional charges such as additional or a need for a second trust, etc. it will be discussed at that time. You are under no obligation to continue and you will not be charged for the interview. Make a financial power of attorney. It's both an honor and a burden to serve as someone's executor. An executor is entrusted with responsibility for winding up someone's earthly affairs -- a big or little task, depending on the situation. Essentially, an executor's job is to protect a deceased person's property until all debts and taxes have been paid, and to see that what's left is transferred to the people who are entitled to it. The law does not require an executor (also called personal representative) to be a legal or financial expert. But it does require the highest degree of honesty, impartiality, and diligence. This is called a "fiduciary duty" -- the duty to act with scrupulous good faith and honesty on behalf of someone else. Decide whether or not probate court proceedings are needed. 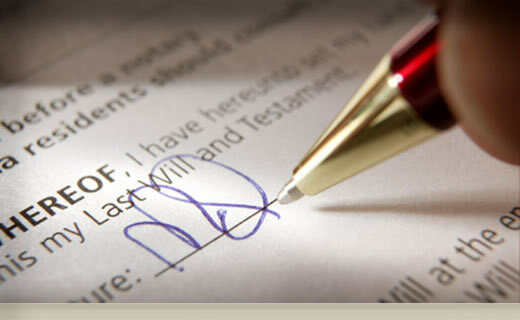 File the will (if any) in the local probate court. Find the deceased person's assets and manage them during the probate process. Set up an estate bank account. Use estate funds to pay continuing expenses. The executor may need to pay for example, mortgage payments, utility bills, and homeowner's insurance premiums. Supervise the distribution of the deceased person's property.